My client is a legal firm specializing in employment law, with a specific focus on workplace gender discrimination and sexual harassment. By focusing on Conversion Rate Optimization tactics, I converted anywhere from 25 to 40% of all paid Google traffic. The average conversion rate for the legal industry is only 7% . This isn’t a case study about how I used proper geographic and keyword segmentation to achieve high conversion rates. Nor is this a case study about how using the SKAGs approach (Single Keyword AdGroup) would improve conversion rates. And this also isn’t about how using proper ad copy to match each adgroup would improve quality score of each keyword and ultimately the conversion rates. Why? Because none of these tactics are enough to compete with legal firms with big advertising budgets. 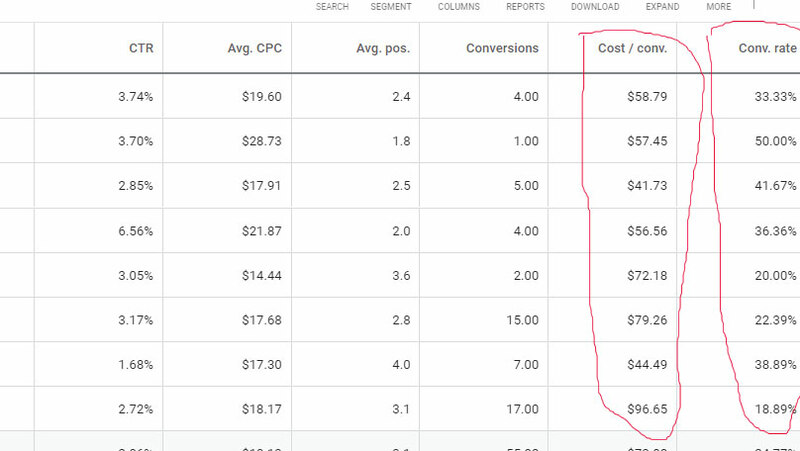 Instead, this is a case study about how to do that one thing that most PPC agencies aren’t doing when managing the Google ad campaigns of law firms. And that’s using empathy as a way of connecting with a prospective client. Go skim through hundreds of webcopy of landing pages belonging to legal firms. You’ll see certain copywriting elements that unite them all. They’re written in a very academic, cold, and matter of fact kinda way. They speak of facts, use big words, and make references to laws or statutes. Basically they sound like something a lawyer would write. In fact, some of the web copy probably WERE written by lawyers! And others were written by marketers who were trying to speak lawyer-ish. Descriptive Page Header – The header is the first thing everyone sees when the page loads. There’s no fancy hyperbole or slogans here. 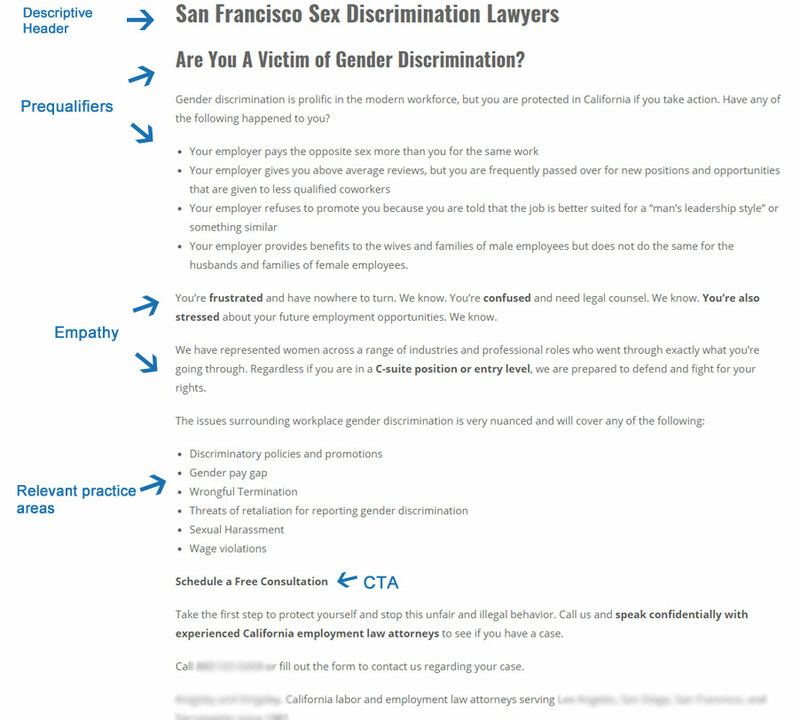 We quickly show who we are (gender discrimination lawyers) and where we serve (Los Angeles). Title headers that match the keywords you’re bidding on also helps contribute to a higher quality score with Google. Pre Qualify with scenario triggers – The first couple of paragraphs is where most law firms screw up and inevitably lose the visitor. They talk too much about themselves. Instead, I quickly list what I refer to as common “scenario triggers” that can help the visitor quickly assess if the firm is relevant to the visitor’s need. Gender discrimination in the workplace can present itself in many ways so it’s difficult to list all of the common situations. But I felt the ones listed were a good enough to cover common scenarios. List relevant practice areas. Gender discrimination can sometimes crossover into other areas of workplace discrimination so we list other practice areas that may be relevant to the visitor. These are other keywords that we were competing for as well. Including them may help improve the Quality Score for the bidded keywords. Improved quality score means that we pay a lower cost per click for the keyword. Offer a Call To Action (CTA). All data shows that using a call to action will always improve conversions. Alot of people that just leaving a phone number or contact form will suffice. But you really need to direct the visitor and be explicit in what you’re offering. In our case, we want them to schedule a free consultation. We offer them the opportunity to either call us or fill out a form. Bold and Underline Where Necessary: It’s often said that people don’t read webcopy. They scan it. Bolding and underlining is key to keeping the attention of the reader while you guide them down the page. Social proof. While we stripped out those elements in the screenshot, it’s important to convey credibility. Showing previous cases that we won, final amount won for the client, and positive testimonials all go a long way. We also include logos of AVVO and Super Lawyers. Because all the cool lawyers are doing it. Above and beyond all of these tried and true copywriting elements, I focused on one element more than any other. And that’s empathy. Lawyers are seen as cold and calculated professionals. No offense to the lawyers reading this. Please don’t sue me! Warm fuzzies isn’t the first thing that most of us think of when it comes to lawyers. Regardless if you’re hiring a lawyer that specializes in DUI, divorce, or workplace discrimination, chances are, you’re probably experiencing stress and other negative feelings. It’s really important that lawyers put aside the “matter of factness” webcopy and empathize with the visitor’s current mental state. Show that you care. Speak to their needs. Not to your credentials. Note that workplace cases are often long and drawn out over many months. So I don’t have data on ROAS. But many cases, if won, can net a very high ROI. Case Study: Facebook Advertising for High-end Restaurant.